PokerStars: Sunday Million with $6,000,000 guaranteed! Tags: 6th anniversary sunday million, jason mercier, johnny lodden, liv boeree, pokerstars, promotions. Posted on Friday, February 24, 2012 by "T". The celebration of different milestone hands and other things never seem to stop on PokerStars. But it's all good since PokerStars keeps on spoiling its customers with amazing cash prizes everytime they celebrate something. 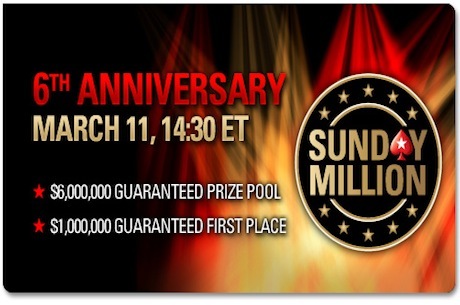 On March 11, 14:30 ET, it's time again as PokerStars will be celebrating the 6th Anniversary of the weekly Sunday Million tourney by hosting a Sunday Million tournament with an amazing $6 million guarantee. The winner of this tournament is guaranteed to walk away with at least $1 million! "My favourite memory of the big Sunday tournament on PokerStars is the time I finished 12th. This was my first really deep run in a tournament of this size, and I was so excited. There is a huge Sunday Million on March 11, with $1M guaranteed for first. It may not feel the same for me as the first time I went deep, but I'll be trying just as hard. See you there." "When I think of the Sunday Million, I think back to being a 19-21 year old kid, grinding mid-stakes, looking for that big tournament score. I would get excited every week to play the Sunday Million, hoping that would be the day that I would have my first six-figure score." "This is one of the few tournaments where you can really score big. I have fun memories of playing the Sunday Million with my buddies, with football games on TV in the background. A friend won a big Sunday tournament in the old days, and first prize was $8,000. 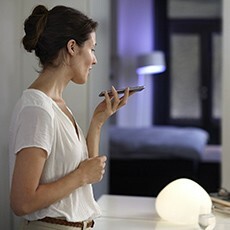 A long way from where we are now!" "When playing the Sunday Million, it's important to be patient. It attracts huge numbers, and in order to navigate your way through, you have to learn to play the waiting game if the cards don't cooperate." EPT Grand Final: 15 Players Left - Johnny Lodden Out In Front! 12 comments for "PokerStars: Sunday Million with $6,000,000 guaranteed!" Must have incredible feeling playing at final table. Good luck to all who's participating! Well I guess I will try to qualify through a sattelite. Maybe I get lucky and win an entry for this. Never played such a tourney before so it would be very interesting to me to participate. If someone at Pokerstars could manage to win more than one of this events, it would be doing enough to enter the best winnings Top20, at least. The problem is, with millions of players around and 10% of them going to try to get it, it turns almost impossible to get more than a first prize from this tourneys. Pokerstars really rules with all this events, just hope their managers keep the company in the right way! Mission impossible ---> I'll better go to see it in cinema, than spend 5 hours online for nothing. It makes me laugh......everyone wants something and some people go on and make the effort to get something whether it through mad perceverence from a freeroll to someone coughing up a decent buy in or the organiser making money on setting up a fantastic offer. There is always different ways of making money, all we have to do is make our choices about how to try and do it. Its a balance guys; just try and enjoy yourself as you follow whichever course YOU chose and dont moan too much about your own choices! Poker is such a release.... I sometimes dont care that I bomb out with a monster to a random loser of a hole hand cos thats poker! And dont foget, someone always wins! Now these must be heaven for all online tournament players, i mean it's known that pokerstars is the site to choose when it come to mtt.